Audi confirms TTS pricing | What Car? 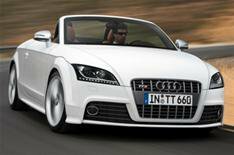 The Audi TTS Coupe and Roadster will cost 33,380 and 35,380 respectively when they go on sale this summer. Powered by a 268bhp 2.0-litre TFSI engine, the TTS Coupe has a 0-62mph time of 5.2sec and a limited top speed of 155mph. Average fuel consumption is 29.3mpg and carbon dioxide emissions are 191g/km. The Roadster is only marginally slower, managing 0-62mph in 5.6sec, with the same limited top speed of 155mph. It does 28.7mpg on average, but emissions are slightly higher at 195g/km. Performance can be enhanced further if you opt for the S tronic semi-automatic gearbox, rather than the standard six-speed manual transmission. This gearbox has six forward gears and two clutches. It can change gear in two-tenths of a second, shaving 0.2sec off the manual's 0-62mph time. There are two settings for the suspension: standard and sport. In sport mode, the car's body is lowered by 10mm to improve balance and handling. Emphasising the TTS's position as the flagship TT are sports seats, 18-inch aluminium wheels and bi-xenon headlights.